A BEACHSIDE Paradise , this large, classic 'Old Florida' Key West style beach home features 5 large bedrooms and 4 bathrooms elevated on beach pilings with approx. 2,700 sq. ft. under air. Distinctive 'Old Floridian' metal roof, open and airy, our home is capable of accomodating up to 10 in complete comfort; each room is beautifully appointed, with stylish home furnishings in a Florida beachside theme. THE FIRST FLOOR: has 3 large bedrooms-two rooms, one being a master with a private bath, each have queen-size beds. The third room has a set of twin beds, with access to a second full bath. This floor, tiled with decorator 18' Italian tile, has a large dining room and fully equipped kitchen with a full array of kitchen appliances and kitchenware. The oversized breakfast counter and dining room is ideal for large group feasts. This new kitchen has beautiful maple cabinets accented by Italian granite counter tops. The living area, one of two full living rooms, has beautful French doors, allowing for spectacular gulf views, each leading onto an open, breezy deck with seating for outdoor dining and fun. Across from the living room, is a Cantina style bar with four generous bar stools to kick back and relax over a cocktail. THE SECOND FLOOR: offers gorgeous panoramic gulf views from the living room. Step out to one of two observatory decks for exceptional private tanning, cocktails and sunsets. Sleeping arrangements on this floor include another master bedroom with a king size bed and private full bathroom. The second large room features twin beds with access to the second bathroom. All rooms are furnished with oversize comforters and large pillows. Linens and bath towels are provided. The second floor offers a laundry room with full washer and dryer, iron and board. Beach Towels, videos and books, are also provided for your use. We have available a high chair, playpen, and videos, for our toddler guests. This home maybe rented as a 3/2 30 days prior to arrival date, during value and fall seasons. Call us directly for pricing on this option. For testimonials of satisfied vacationers, we have many guests that have allowed us to share their email address, so you may inquire about our accomodations. Ask, and we will provide these to you readily! Property Address: 5420 Estero Boulevard--MID ISLAND-BEACHSIDE. Area attractions: Close to great shopping. Outlet malls within a 20-30 minute ride are the Sanibel Outlet shops, on the drive to beautiful Sanibel/Captiva Islands. Also, off of exit 22 and I-75 are the fabulous Miromar Outlet shops, with designer and mall outlet shops. Finally, Bonita has a wonderful newer mall called Coconut Point, off of US-41 north of Bonita Beach Road. This mall has great dining and incredible mall stores, in an outdoor, airy atmosphere. Our family has always enjoyed the beach. Our love of S.Florida and its diverse population is why we keep this location our permanent home. Living on the east coast, allows us the 'best of both worlds', with the Gulf just two hours away. When our children were young, we enjoyed going to a beach that typically was not too deep for our toddlers. This allowed us some flexibility in relaxing on the sand, with out the constant threat of deep waters for the kids. Typically, the warm Gulf waters will settle right about knee length, which is great wading water for kids. Teens can enjoy skim boarding on the beautiful waters. Jet Skis, tubing and other water sports are all at in your reach at Ft. Myers Beach. We are afforded the luxury of being beach side (no crossing busy Estero Boulevard) yet, right off the direct sands of the gulf allowing for less expensive pricing. Direct Gulf front typically runs 10-15% more than the 'one back' homes. A true plus in this tough economy! toilet, combination tub/shower, Private bath in first level master. toilet, shower, Upper level bathroom. The beaches are sandy white and soft. Great shelling on nearby Sanibel/Captiva Islands. Steps away from the Gulf, enjoy the sounds and sights of the water from our home, yet not the high beachfront prices!! Called 'one back' we are behind a smaller, flush to the ground home that sits directly on gulf. 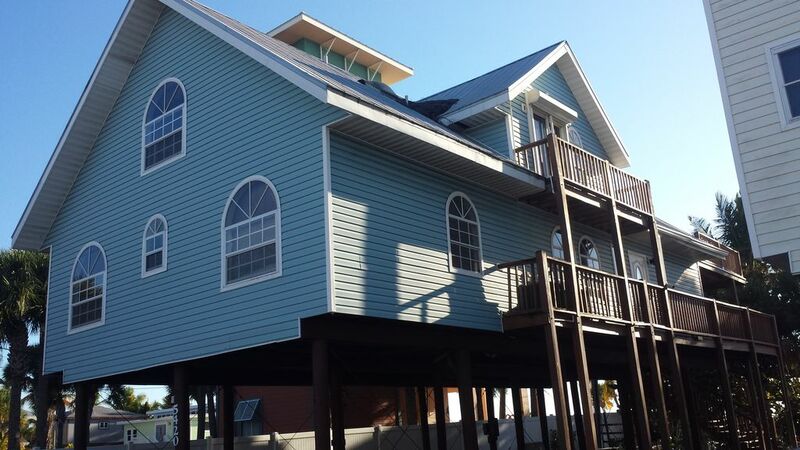 Our walkway from the home is deeded around this home, and you are on the sand in moments. Bring chargers and cell phones! NO phones available on site. Dual Units, each controlled individually, one thermostat per level. Reverse cycle AC units will heat also on those rare, cold S.W. Florida nights! Also limited number of beach towels available for your use. Washer and Dryer located on second floor. Limited number of beach towels available. All bathrooms have white, towels in several sizes for your use. Wireless is available. Password protected. Comes with door dispenser for both ice and water. Honey cabinets with upgraded granite tops. Refrigerator, dishwasher, stove, microwave, coffee machine, mixer, rice maker, and waffle maker. Large table can sit up to 6 with dining chairs. Right next to this is are 4 bar stools with additional eating space. Two TV's available, each in the living areas of both floors. Flat screens. Basic cable TV available on all TV sets through Comcast. Selection of children's videos and some DVD's available during your stay. Full access Video store available on island. Upper deck great for sunbathing. Use at your own risk. Paddle replacement cost, if lost, $45.00. Dual central a/c units, cable equipped TV's, VCR (2), stereo, fully equipped kitchen, including microwave, refrigerator with ice maker, and ample cutlery and china, coffee maker, blender, rice maker, expresso machine, hand mixer and waffle maker also provided, Linens and large supply of bath towels included, Washer & Dryer on second floor, ample covered parking for boat and cars, BBQ grill, outdoor patio furniture (seats eight), ceiling fans throughout the home for your comfort. Trolley stop for local commuting available in front of the home, local video store stocks lastest releases, and many other VCR tapes, magazines, books, and board games available on site for a relaxing vacation, NO SMOKING inside the home. Pet allowed with owner's consent and modest fee, Call for details. Wonderful stay at the Blue Dolphin Beach House! This house is big and beautiful! Perfect location on the beach! The house was so clean and well supplied with anything you need. We will definitely go back in the future! Great time. Owner was very responsive to our needs. Location was good. Construction on that road and typical traffic issues are always a bummer but come with the territory. Thank you again for your great service and home. The Blue Dolphin house was the perfect place for our family vacation. We were literally steps away from the beach which allowed family members to enjoy an early morning walk or stay at the house to play games. The trolley stops at the end of the driveway and will take you to the hubbub of Times Square for a minimal fee. We enjoyed the tranquility of the beach as the house is situated south of the main Fort Myers beach. We had a rainy day in which we were able to visit the Edison and Ford winter estates. Located in Fort Myers, it's well worth a day if you have time. Overall, we had a fantastic stay and hope to be able to visit again. It was a pleasure having you stay at our home! You took wonderful care of the house, and we are very grateful. Hope to have you return in the future! Plenty of room and bathrooms. Worked well for us once we called and learned about turning on lazy plumbing fixtures. Covered porch and covered parking was nice with the heat. Beach had some of the least seaweed compared to rest of FMB. Great house for our family beach vacation. The bedrooms worked out great for our group and the living room areas too. My wife and I either ran or walked the beach daily, which is right there. Depending on the time of day, the traffic was somewhat congested (but I'm guessing that is common this time of year when there are lots of vacationers from the cold and snowy north). Linda was great and made sure we encountered no problems. Thank you Brian for taking the time to review our home. We are happy you had a memorable experience and hope to welcome you back in the future. Also, thank you for taking such great care of the house. Your group was an ideal group to have stay at our home. Our family of nine and two dogs had a wonderful stay at this beach house. We all cooked Thanksgiving dinner thanks to Publix being just a few blocks away. The beach was awesome, dog- and people-friendly, and some of us went fishing one day and on another day visited the Edison-Ford winter estate in Fort Myers. Try to see it; very interesting! The weather was grand, which always helps to make a vacation memorable. I would certainly recommend this property.